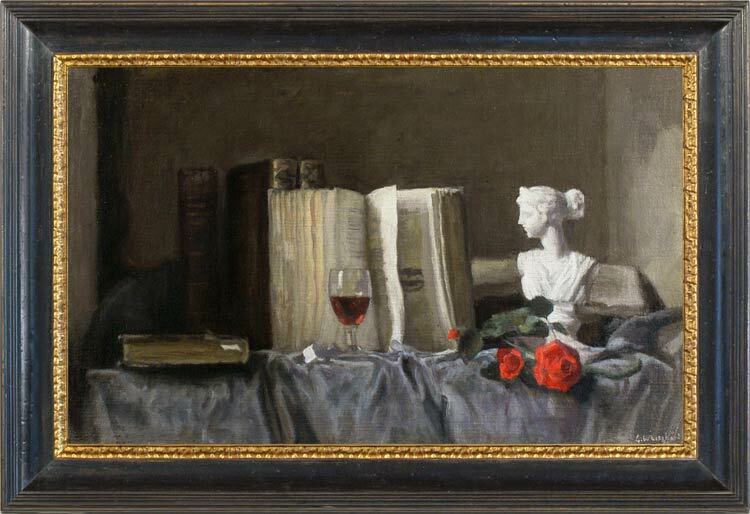 Another of Weissbort’s compositions which refers to Chardin’s work, this is a femininized version of the latter’s Still life with attributes of the Arts. Where Chardin uses a winged head of Hermes, Wiessbort paints one of the Muses – possibly Clio, the muse of history; in place of draughtsman’s tools, rolled plans and books which are palpably non-fiction, he chooses books which are more likely to be novels, with illustrations; he covers the bare wooden table with a fall of soft blue fabric; and he adds a (small) glass of wine and a red rose. This is a witty play on an Old Master for an art lover to recognize and appreciate, and reveals overtly the art historical knowledge which underpins all Weissbort’s work.